Over Christmas and New Year, I tested HMD Global’s flagship phone, the Nokia 8, and after a month or more of use, it didn’t let me down. I can safely say that I would recommend this smartphone, especially if you are on a budget. HMD, can you restore Nokia to its former grace and glory? At first, I didn't have any opinions or expectations about the phone as i’m constantly testing devices, and I am quite used to using a variety of smartphones. Remembering the testing of the Nokia 6 I did last summer, I didn’t think the Nokia 8 would even come close to impressing me. Nokia offers more with this model than my colleague Pierre suggests in his Nokia 8 review, so I’m here to defend it. After activation in mid-December, I was able to update the Nokia 8 with the latest security patch. Then, on January 17th, the test device received the January patch. Thanks to the A/B updates, you can install them and not be disturbed while you are using your phone, and a quick restart will activate them. After this, you can use your phone as normal with no problems. The only downside so far, is that the bootloader is locked, and currently, it's not possible to unlock it. 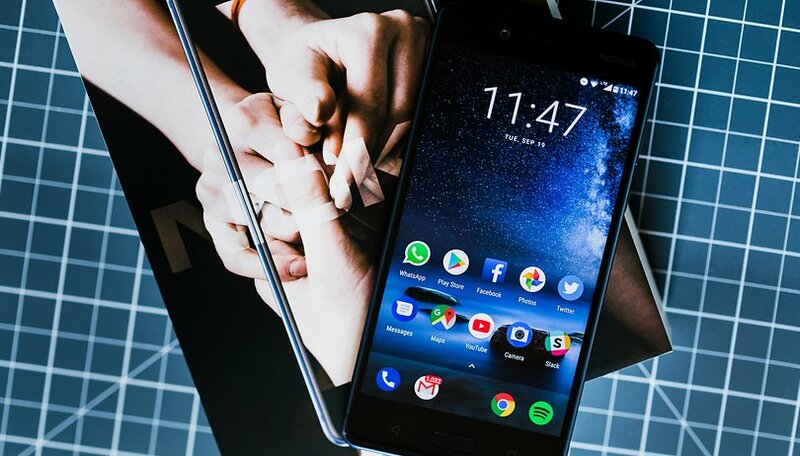 Project Treble, a rework of the Android OS framework which is important for modders, is not supported by Nokia in this generation of smartphones. If HMD Global improves on this, the manufacturer could gain a significant fan base and become serious competition. When Nokia opens up to the modder community, OnePlus should watch out. Nokia’s smartphones are cheaper than the OnePlus 5T, and they are also cheaper from carriers. Another great feature on the Nokia 8 is the MicroSD card slot, whereas unfortunately, OnePlus don't offer removable storage on their devices. Apart from this, the Nokia 8 has similar features that could compete with the OnePlus 5T. Choose “Nokia 8” or “OnePlus 5T”. The Nokia 8 opted for Android 7.1.1, with few additions, keeping the software simple. This means that the battery life is better than the OnePlus 5T, however, the time it takes to charge is longer and doesn’t compare to OnePlus’s Dash Charge. One of the major criticisms made by Pierre in the Nokia 8 review was against the camera. I have to admit that they should have made the effort to create a better one. I was only able to take good photos outside, whereas inside the camera seemed to lose focus quickly, producing blurry photos. Unfortunately, the camera limitations are due to the hardware, and knowing this we can be certain that the quality of the camera and videos will not improve with updates. Hopefully Nokia will improve on this when developing their next generation of smartphones. HMD Global wanted to draw attention to the camera technology on this phone and to its partnership with Zeiss. They installed a larger aperture, which has achieved good results overall. However, Huawei is now working with an f/1.6 aperture, and together with the AI technology in the Mate Pro 10, it takes much better shots in poor lighting conditions. Although the camera is not great, it does fit the price. It’s important to remember that the Nokia 8 is much cheaper than the Mate 10 Pro, or the Pixel 2 XL for example. What do you think about the Nokia 8? Are there any other features missing that you’d like to mention? Leave a comment. Camera issue is not a hardware limitation , it's purely software. Using GCam produces stunning photos with the Nokia 8 , way better than most of the current flagships. I expected better from Nokia since they used to be known for their Camera Software. It's really poor from Nokia's part. Dude, Nokias camera is not limited by hardware, it's limited by software, so it can improve with next updates. Meanwhile installing gcam mods can corroborate what I say. That nokia looks impressive . Hey Eric, I'm using Nokia 8 for a couple of months now. I have solved the Nokia 8 camera's blur photo problem with a free app called "Anti Blur Cam" by Lapis Apps. This app takes three photos in quick succession and merges them. After using Google camera mod for a while, I can assure you that the poor image quality is not a hardware issue - it's all about the software. The copper model which I like can be had on Amazon for 449.00. I can forgive the camera at that price. Stock android, 700 nits display, headphone jack, micro s/d expansion. I think this is a good effort for the price!